Once upon a time… there was one of the most depressing animated adventures ever made. Scurrying after ace rodenty ‘toons Flushed Away and Ratatouille, this Brit fairytale begins when travelling rat Roscuro (Dustin Hoffman) falls into the Queen’s soup. And she drops dead. That’s right. Doesn’t faint. Drops dead. The King spends the rest of the film crying his eyes out. Most young children will probably do the same. 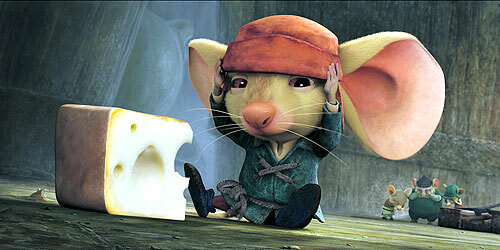 Banished to the dark, dirty rat underworld, it’s up to Despereaux (Matthew Broderick) – a tiny mouse with a big ears and an even bigger heart – to bring light and love back to the kingdom. Did we say dark and dirty? We meant it. Given scraggly fur and twitching whiskers by the muted, painterly visuals, the rats look more like disease-sodden vermin than cutesy pets. Bold and detailed? You bet. But there were more laughs in The Dark Knight.